Practice verbals (gerunds, infinitive, participles) with over 50 sentences for studying. Study the different types of verbals in a variety of ways. This activity is for practicing the recognition of verbals: participles, gerunds, infinitives. It contains two grammar sorts (with fifty sentences) and an exit ticket. → 30 sentences that students must sort. The sentences contain a participle, infinitive, or gerund. Students must place the sentence in the correct column. → 20 sentences that students must sort. The sentences all contain a gerund. Students must place each gerund in the correct column for how it is functioning - subject, direct object, indirect object, or object of a preposition. For differentiation, one copy of the sentences are blank, and the second copy has the gerund underlined. Choose which to use! You should see this picture in the thumbnails. → An exit ticket. Students must complete fifteen sentences (three for each verbal) with an appropriate verbal. Possible answers are included. → An answer key is included for all three activities. 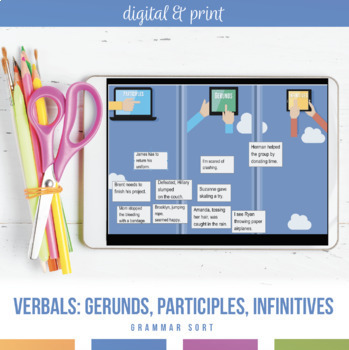 This activity provides over 50 practice sentences for understanding verbals - infinitives, participles, and gerunds.